Hilleberg has a long-earned reputation for making bomber expedition tents, and this year they introduced a three-person version of the popular Allak 2 tent. I took it up in the Front Range mountains of Colorado several times this winter to test it out in winter conditions. The purpose of this tent was obvious the moment I pulled it out of the stuff sack: this is a burly tent built for hard use on expeditions, and it's extremely well designed. Every detail has been tuned to improve performance in harsh conditions, livability, and weight reduction, generally in that order. The Allak 3 has great utility as a four-season tent. The fly and body are attached together, and the poles are set up on the outside of the fly, which means you can set this tent up in a storm and the fly will protect the main compartment from getting wet. In my opinion this is the only way four-season tents should be designed. Also, the tent is free-standing, which can be useful in winter camping if you want to change the orientation or re-flatten the floor. To test the setup process, I tried erecting it in a field of fresh snow, alone, while wearing skis. A more cumbersome task than on dirt, but this is how the tent will likely be used. I found the tent was mostly straightforward to set up; the three poles are the same length, so you can't confuse them, and the pole sleeves are color-coded. The vestibules allow ski tips to pass under the fly while reaching in to clip poles, which helps the process. 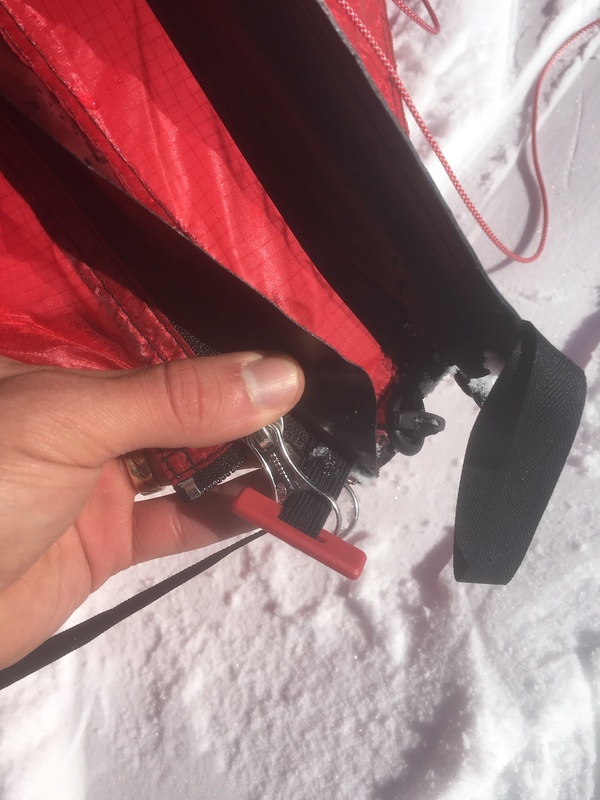 Opinions vary on full-length pole sleeves versus clips; for a winter tent I prefer the clips because sleeves can freeze in certain conditions and become unwieldy. The only part that I found to be tricky during setup involves the removable hexagonal canopy that covers the upper vent windows (probably unnecessary in cold, snowy conditions but likely desired in rain). This canopy only attaches in one specific configuration (it's not symmetrical), yet the dimensions of the hexagon are hard to distinguish when it's flapping in the wind. One side is longer, with plastic clips, and this has to go on the longest, non-door side of the tent, which took me some trial-and-error to discover. I would consider marking the connectors to avoid confusion, or leaving it on the tent attached at two points. 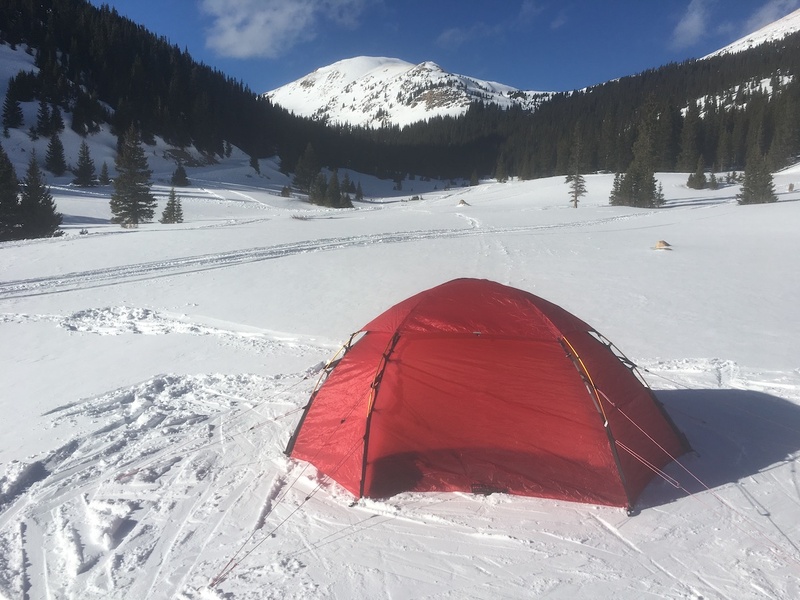 Other than that, this tent is straightforward to set up, even while wearing skis, and can be pitched easily in foul weather. This tent weathered snow and buffering winds with ease. Guy-lines emerge from each of the six corners and can be swiftly tightened thanks to built-in plastic ratchets; these connect high up the walls of the tent and thus provide lots of stability. The floor, made of 70-denier nylon, is rated to 15k water pressure so you can camp directly on snow and a puddle will not soak through as the snow melts. The outer tent is constructed of Kerlon 1200 fabric, a 30-denier ripstop nylon triple-coated with silicone, rated to 5k water pressure (3-4k is common in three-season tents). The fabric is also treated for UV resistance because Hilleberg expects this tent to be left pitched in the sun for weeks on expeditions. Livability: the Allak 3 is simply a palace. Two doors, each with an ample vestibule, make entrance and exits easy. Each vestibule has plenty of room for cooking, changing boots, or storing packs. Inside, there is room for three grown men (I'm 6 feet tall and there is room for my stretched-out feet and a pillow), or two people and a pile of gear between them. The combination of the hanging inner tent and two large, well-positioned ceiling vents help prevent the dreaded inner-wall condensation that can form while camping in winter. With these vents open beneath the protective canopy, I was able to vent all my condensation out the ceiling. All windows and doors have mesh panels for additional ventilation and protection from bothersome insects. There are thoughtful design touches that I really appreciate about this tent. The guy-lines are reflective, the included V-shaped stakes are high-quality and there are elastic "keeper loops" for all the door panels. The zippers are all easy to use and continue to function with some frost, and there are even elastic tabs to keep the zippers from opening in wind. The doors also have unique zipper configurations that allow you to easily open part of the door—while not necessary, this does improve the speed of access in and out of the tent. Overall, every detail seems to be thoroughly thought out. Weight: at a packed weight of 8 pounds, 3 ounces, this is not a lightweight tent, but it is on the lighter end for four-season tents that typically find their way onto glaciers and expedition camps. By comparison, Hilleberg's Keron 3 weighs 9 pounds, 4 ounces; a Mountain Hardware Trango 3 weighs 11 pounds, 4 ounces; the MSR Remote 3 has one vestibule and weighs 8 pounds, 9 ounces; and Black Diamond's Fitzroy—no vestibule, one door—weighs 7 pounds, 1 ounce. 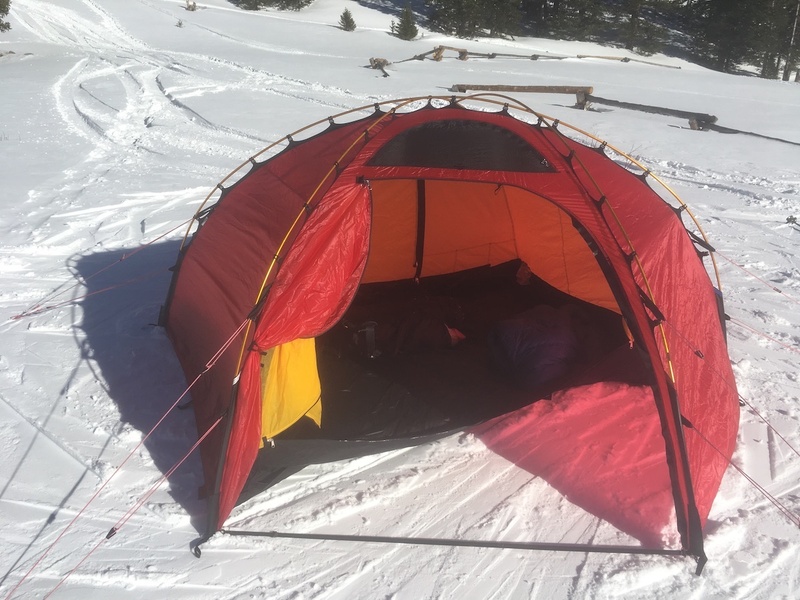 The Allak 3 can be further stripped down: you can erect it without the inner tent for a weight of 7 pounds, 1 ounce, a good option for ski touring or mountaineering where there are no bugs and weight is critical. That's still vastly heavier than pyramid style tents such as the time-tested Black Diamond Mega Light, which has a minimum weight of 2 pounds, 5 ounces, and fits four people, but the Allak 3 offers significantly more comfort and livability for long durations of camping on glaciers or similarly harsh environments. Despite this tent's lighter weight among expedition tents, I would trust it to withstand the rigors of any expedition. The Allak 3 is in Hilleberg's "Red Label" line, which essentially includes tents made of Kerlon 1200 instead of the beefier Kerlon 1800 that is used in their "Black Label" line. Hilleberg officially advises against "using Red Label tents for those doing sustained, multi-month journeys—round-the-world bicycle, motorcycle or trekking tours, for example." 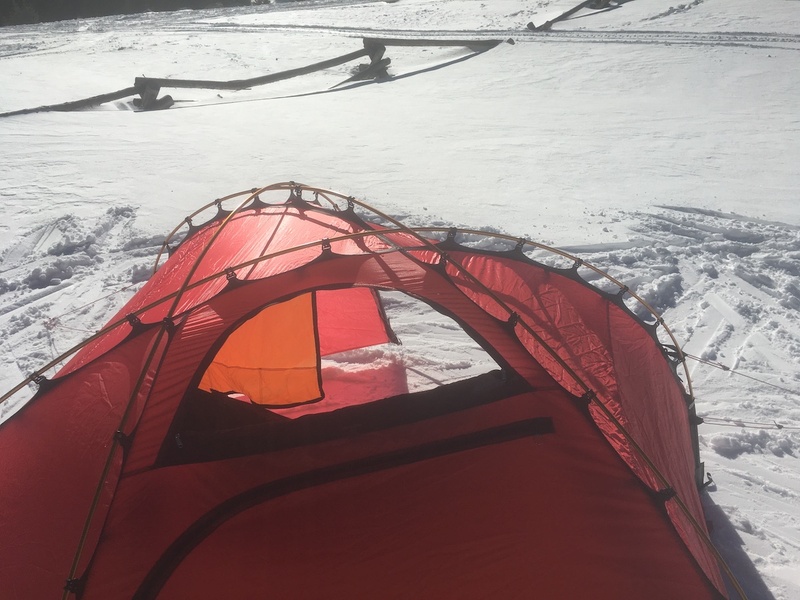 But the Hilleberg website also reports that Red Label tents have been used on rigorous expeditions, such as overland attempts to the South Pole and a solo winter ascent of Denali. The Kerlon 1200 fabric is rated to 12 kg tear strength and is very hard to rip (8 kg is common for three-season tents). My overall impression of the Allak 3 is that it's the best combination of storm-proofness, comfort, and weight among three-person, four-season expedition tents. Its ease of setup, durability, and livability in harsh conditions are all superb. The question is, is it worth the weight for your needs? 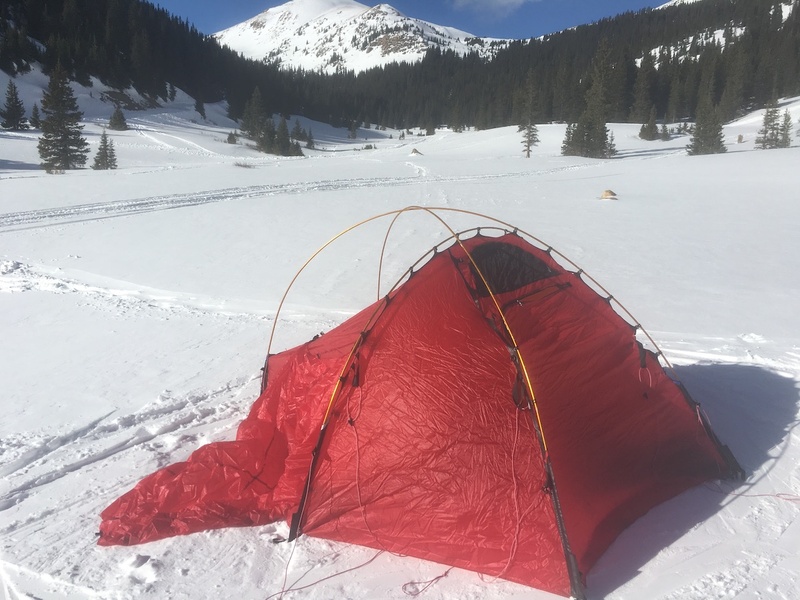 I probably wouldn't use this for summer backpacking, but if I were considering a four-season tent for shelter on an expedition, or a multi-day spring ski tour, this tent would be my first choice. Drew Thayer has been climbing for 15 years, including 10 years of ice climbing and nine years of alpine and big-wall experience in the U.S., Peru, Argentina, Canada and Alaska. He received a Copp-Dash Award in 2016 for an expedition to Alaska in which his team established four new routes in the Neacola Mountains of the Aleutian Range.